Moab, Utah, has been a mountain biking mecca since the creation of the sport. 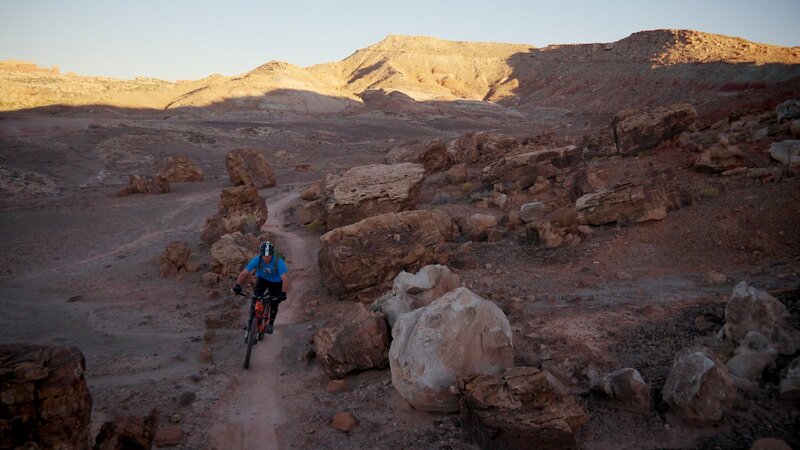 The unique terrain and stunning landscapes offer themselves to any number of outdoor adventures, but the area's veins of Navajo sandstone create a mountain biking experience that makes riding in this area distinct from anywhere else in the world. Shod horses that were originally used to traverse this area had a difficult time finding a good grip on this "slickrock," but the reality for mountain bikes is entirely different; a mountain bike tire will firmly grab the rock, leaving you with the impression that you are riding down a concrete mountain. That said, it is important to note that Moab is geared toward the cross-country style origins of the sport. Whatever trails you choose to ride, the better condition you are in for pedaling, the more fun you’ll be able to have. Even the more downhill-oriented trails still require a significant amount of pedaling effort. However, if you have pedaling prowess, you’ll find the trails technically challenging and the views absolutely unforgettable. In fact, the sheer beauty of the landscape is nearly impossible to describe. You'll see the white-capped La Sal mountain range looming over the deep red and white sandstone hills and hoodoos that are accented by the green junipers and cacti. Even with an ambitious itinerary, you’ll want to take plenty of time to appreciate your surroundings. 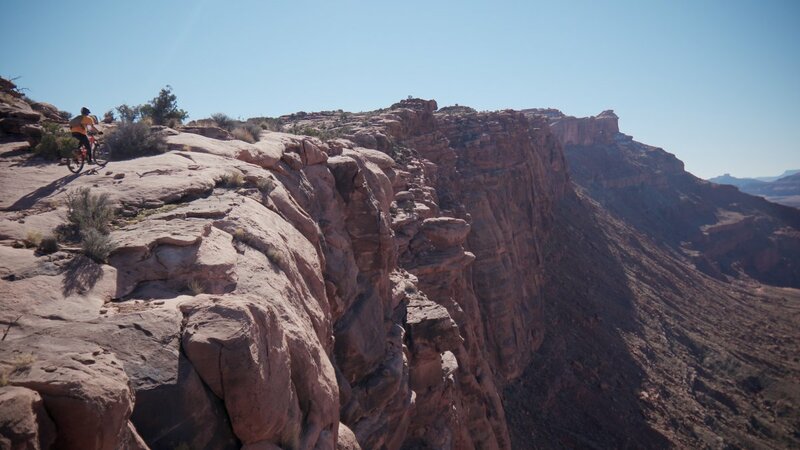 Moab has hundreds of miles of trails and endless areas to explore, and here are a few areas that you’ll want to especially note. In addition, there are other trails in the network. The Moab Brand Trails are a great starting place and make for a fabulous family ride. They offer beginner friendly rides that get you started on slickrock, rock gardens, and the intermittently sandy and hard-packed soil that you’ll find throughout the area. Klondike Bluffs Trails: Jurassic to Dino-Flow. Photo by Brant Hansen. Amasa Back Trails: Hugging the cliffs on the Captain Ahab Trail. Photo by Brant Hansen. If you follow the Colorado River to the west of town you'll find the Amasa Back Trails. These trails are a little more remote and definitely not as family friendly, but they will still have plenty of traffic on them. Hymasa, the main climbing singletrack, follows the Amasa Back jeep trail up the canyon where you’ll eventually peak with stunning views in all directions. At the top of the mesa you’ll find a variety of trails, but many choose to either descend on Hymasa or to hit Captain Ahab. Be aware, Captain Ahab is a descending only trail, and it is one of the most technical descents in the area. It is by no means a “downhill” trail, however, so you should be prepared to do plenty of pedaling. With that in mind, the actual descent itself is a riot of a time that experienced riders will enjoy. On the east side of town lies the Sand Flats Recreation area, which contains the Slickrock Trail itself. Slickrock is the most well-known trail in Moab, and it is one of the best known trails in the world. As its name would suggest, the trail consists almost entirely of Navajo sandstone. It is a long, undulating, pedally ride with stunning vistas, challenging climbs, and fun descents. It is not overly technical or difficult, but beginner riders may consider starting on the practice loop. The practice loop itself is a fun ride that offers many of the benefits of the full trail such as amazing vistas without the large commitment. Finally, no Moab overview would be complete without at least mentioning the Whole Enchilada, sometimes referred to as Porcupine Rim. This is a series of connecting trails that offers a 33-mile descent from the La Sal mountain range down into Moab itself. Depending on the time of year you go, various parts of the trail may be closed due to snow. However, the lower Porcupine Rim trails are accessible late into the fall and early in the spring. This is the kind of trail that is definitely better to experience than to read about. Suffice it to say that the descents are long, fast, challenging, and thoroughly enjoyable, the views are absolutely stunning, and many riders consider this the best trail they have ever ridden. There are multiple companies that offer relatively cheap shuttles to the uppermost section of the trail that is accessible whatever time of year you choose to ride. This is an absolute must do for any mountain biker. Riding the Good Water Rim Trail high above the San Rafael River. Photo by Brant Hansen. Pipe Dream: Accessed from the town of Moab itself. Good Water Rim: Located 2.5 hours northwest of Moab high above the San Rafael River, this is a fast, beginner-friendly ride with breathtaking scenery that you won't find in Moab.